Considering this is a relatively simple piece of fitness equipment which is ideal for beginners – there is a lot of variation in what you can buy. Top-end kit goes for £1500+, while you can pick up a very basic model for £100. This page will help you compare the features and build quality of the different home rowing machine models, so you can make the best possible choice. First up, the most popular machines at low, mid and high price ranges are covered. This will give you an idea of the kind of rower to expect in each price band. After that you’ll find an overview of the different features of rowing machines, so you’ll know what to look for when you compare them. Hugely popular model, this is aimed at beginners looking for a simple rower without all the extras. Cheap price, with a BIG discount at the time of writing!! Great looking folding model from the gym specialists Marcy, this is robust as you'd expect, though you might not expect such a long list of features! Touch button resistance, amazing console and super-smooth. This is gym-spec kit for your home, I have to say it looks the part too! With plenty of weight training experience, BodyMax kit is as solid as they come! Rowing machines can be divided into the following price ranges. Budget models I count as under £200, while there are a limited number of sub-£100 rowers, it is much harder to get quality gear at this price range than with (for example) exercise bikes. There are some good deals to be had at this range. What I find is that the best offers are those mid-range machines which have a decent sized amazon.co.uk discount! Mid-range models are the sweet spot. Here you will get smooth magnetic resistance and preset programs on more advanced consoles. If you know that you enjoy rowing, and are looking for a machine to last, then this is where you need to be shopping. Mid-range rowing machines start at around £200 and go up to around £500. Again, there are bargains to be found. Where Does ‘Gym Spec’ Start? You can more closely replicate gym-level equipment with rowing machines than with many other types of fitness equipment. The best machines can go for up to £1000. At this level you’ll get a lot of style as well as substance. For example the wood-effect natural Water-Rower range. Below you will find summaries of 2 from each bracket. I have chosen contrasting options for each pair – to show you the variety of machines available. If one does not jump out as ideal for your needs, then the next section below covers the different features of rowing machines. Once you work through which features are most important for you, choosing a model that fits will be much easier. At the end of this page you’ll find very quick summaries of all of the rowers covered here at FitnessReview.co.uk, along with links to each detailed review. This is really a mid-range rower, though the huge (with my usual ‘at the time of writing’ disclaimer) discount bumps it firmly down into the budget range. You’ll get a lot of features that other budget rowers miss – for example 10 levels of magnetic resistance and a super-quiet mechanism. What really stands out with this model is the very positive feedback from current owners, the word ‘recommended’ comes up a lot. Without the discount this would be a solid mid-range rowing machine – with this it simply blows the budget-level competition away! Read my detailed review of the JLL R200 Rowing Machine here. Or, check the feedback and current discount for yourself on the Amazon.co.uk product page. I see this one as the best option for those who would like to check out a rowing machine, though are not completely committed to this form of exercise. For less than £100, you get a decent basic rowing machine that has been adapted so that the pulley system works in other ways. You can use the same setup for arm and shoulder and even abs exercises. Even at this budget price point you’ll get a LCD display covering all the regular stats (speed, distance, calories and so on). This rower is foldable, a big plus for these machines – which can take up a lot of space. York Fitness have a solid reputation and create many different types of mid and budget range fitness equipment. Their Excel 301 Rower has excellent feedback – and serious good looks, especially around the colour console and its supports. You’ll get a lot of rower for your money with this model, with preset programs, magnetic resistance, built-in wireless receiver (for monitors) and a one year warranty too. This is firmly in the ‘sweet spot’ of features for the price for me, well worth checking out. Distinctive good looks make this Kettler rowing machine stand out from the crowd. Unusually, the maker also talks about the sweat resistant key-pad on the console (I’m not sure how sweaty the end of your index finger can get, though it is a nice thought!). On a serious note there is a 4kg flywheel which powers 8 levels of smooth magnetic resistance. Feedback is strong for this one, with minimal home assembly required on delivery. Its easy to throw around words like ‘gym spec’ when reviewing fitness equipment. Though in the world of home rowing machines, this comes close. I should note that the Infiniti B200 comes even closer (though at a higher price). The difference is in the build quality, flexibility of the programs / console and in having touch-button resistance level changes. With all the lower end and most of the mid-range rowers, you’ll need to stop and change the resistance by turning a knob. With the BodyMax B100 you can do this at the touch of a button. When it comes to preset programs, you have a new level of flexibility. As you might expect, feedback from current owners of this machine has been excellent. Check out my review of the BodyMax B100 Rowing Machine here. See the powerful spec and check the feedback on the amazon.co.uk product page here. This is a model I’d love to have in my gym. It simply looks stunning, with a wooden design and water bowl. The transparent water bowl is not just for looks. The resistance is provided by this water – recreating a ‘natural’ action as closely as possible. You’ll get the electronics and the build quality to go with the upper-end price tag. Simply put, a wonderful looking rowing machine. Check out my Water Rower Natural review here. Here are some of the key factors to look out for when deciding which rowing machine to buy. If you are stuck between 2 or 3 models, then simply picking a couple of the criteria below which are most important for you can swing the decision one way or the other. #1 – Magnetic or Air Resistance: There are 2 basic formats which create resistance against your rowing action. Air resistance are the manual machines, which use the pumping action of the air as you move back and forth to adjust how tough your rowing is. Magnetic resistance is created by magnets against a wheel, giving you more control over the pressure. Magnetic pressure rowing machines are more expensive. Some machines use a combination of both air and magnets to create a smooth and realistic experience. You can also find specialist high-end rowing machines which use water resistance. You might also find latex cord resistance machines, these work fine – though many users are skeptical! Top end models now use water resistance. This article compares 3 of the best water rowing machines. #2 – LCD Screens: At the mid-level and above, you’ll get a screen which tracks your progress – or even allows you to set a program of changing resistance for your session. I find that this helps my sessions, it is always good to know how many calories you have burned or how much further you have to row before you hit that goal. #3 – Build / Comfort: As you look through the linked rowing machine reviews, you will notice that some machines look like a pole with a saddle, while others look like solid pieces of equipment that you are more likely to find in a gym. These not only make a difference to your workout, there are big differences in how easy they are to store too. #4 – Monitors: Mid-range rowers will often have pulse rate monitors (in the handles), some more advanced models will do this wirelessly and even adjust the program accordingly. Some will have compatibility with POLAR monitors or fitness apps. #5 – Max User Weight: Some of the lower end rowing machines will have restrictions on the recommended weight of the user. If you are comparing rowing machines for weight loss purposes, then make sure that you keep this in mind. #6 – Folding: Don’t overlook this one, as rowing machines can take up a lot of floor spaces. When choosing a folding rower, it is essential to get one with solid build quality, you do not want a wobbly rower! Here are links and 1-line summaries for all of the rowing machines reviewed here. I have noted the price bracket for each rower, though these are not ordered by price. 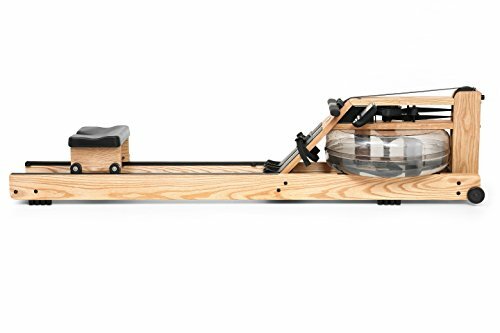 Concept 2 Model D Rower: A best seller in the upper price range. This folding model has a unique console, its own tracking software (for your phone or computer) and a spiral resistance changer too. York Fitness Excel 310 Rowing Machine: This is my top pick for mid-range rowers and comes from a very popular manufacturer. Smooth magnetic resistance and very solid feedback from current owners. Christopeit Cambridge II Rowing Machine: Unusually, this one uses latext cords instead of a chain and wheel setup for the rowing mechanism. Budget price range and some good feedback too. BodyMax Infiniti R100 Super Rowing Machine: Higher price range, though an amazing machine. This is the first (of only two) that I would be happy to give the ‘gym spec’ label. Touch button resistance changes make those preset programs very flexible. Water Rower – The Best Rowing Machine Available? WaterRower A1 Home Rowing Machine: Upper price range again, though you are paying for the great (wood) looks as much as the spec with this one. Would look amazing in anyone’s home gym. Body Sculpture BR1000 Rowing Machine: Budget rower and one of the most popular choices. If you are looking for a versatile and solid model that will not break the bank – then this one should be on your list. Hammer Cobra XT Rowing Machine: Mid-range model which benefits from that famous German engineering. This has a solid spec for a lower mid-range price and the feedback has been very positive. Kettler Premium Magnetic Rower: One of two mid-priced rowers from Kettler. This one includes continual pulse rate monitoring which enables ‘target zone’ training. Some solid feedback for this model. Kettler Stroker Rowing Machine: This is the more popular of the Kettler mid-priced models. Flexible and versatile for home use – this rower ticks all the boxes for features, monitors and durability. Marcy Regatta Rowing Machine: Another mid-range model, this time from home multi-gym specialists Marcy. This rower has distinctive looks and comes with a high specification for the money. Water Rower Natural Rowing Machine: Made from ash, with a transparent water bowl providing the resistance, this is the best looking rower I have ever reviewed. Upper price range level. Body Sculpture B3010 Rower and Gym: This budget range model uses the pulley system for both rowing and other exercises – a smart move, and one which seems to have been popular with owners too. JLL R200 Rowing Machine: This is a budget priced model which is really mid-range spec, the huge (at the time of writing) amazon.co.uk discount makes this a top-rec for home users. JTX Freedom Rowing Machine: This model has a mix of air and magnetic resistance, aluminium frame and 2 years at-home parts + labour warranty. A popular mid-priced choice from a respected fitness equipment maker.